CPA Group’s Health & Wellness calendar ensures we (and our clients) are constantly reminded of the importance of awareness and prevention when it comes to common, but not always well-understood, health issues. For CPA Group and our clients, our most valuable asset is our people, and when knowledge can support the safety, health and wellness of our team, we leave no stone unturned! March 2019 saw a focus on skin cancer, a potentially highly dangerous form of cancer, particularly in Australia, but one which can be highly preventable, and if detected early, treatable. 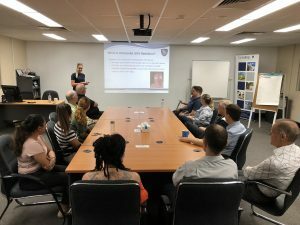 Our Head Office team was privileged to have in our presence for this month’s seminar, Samantha Pearce, our Perth-based Operations Manager, herself a Registered Nurse and one of the key architects of the CPA Group Health and Wellness Program. 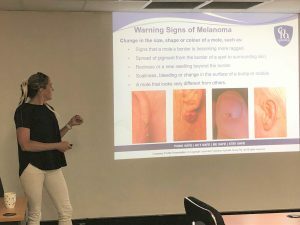 In an entertaining but at the same time sobering presentation, Samantha showed us the types of skin cancer and their consequences, as well as a real-life example reported by one of our site-based medical staff. Skin cancer is preventable and we must continue to educate the workers located at our various operations sites so that early signs are identified and treated appropriately.